One of the best ways to transform any space is to add eye-catching rugs and carpets. You don’t have to buy new carpets too. Just use any colorful carpet you have in storage and put it in strategic places of the bathroom to liven up the space to accentuate certain areas like the bath tub area. When choosing carpets and rugs, go for modern, colorful ones and not the Oriental rug your nana gave you last Christmas! There’s two ways to do this. One, you can bust out the power drill and start adding stylish shelves from the wall. You can check out many online tutorials on DIY shelving. Two, you can simply incorporate portable shelves in the bathroom. Whichever way you choose, shelving are not only functional pieces, they also transform the overall design of a bathroom. Just make sure you don’t choose bulky shelves in small bathrooms. Remove that ugly, outdated, boring mirror and get a really stylish mirror that’s as big as the size of the bathroom allows. When it comes to bathroom mirrors, basic mirrors just don’t cut it. 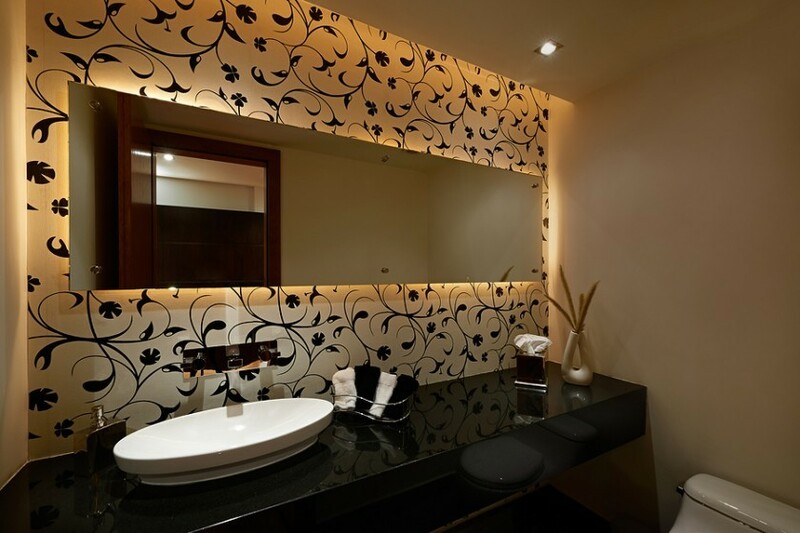 A nice mirror instantly adds a touch of élan to the bathroom and opens up the space even more. Decanters and colorful glass jars are not only functional, they also accentuate any space. In the bathroom—rather than using shampoo bottles or shower hangers—de-bottle your cleansers, shampoos, and body cleansers into gorgeous, colorful bottles. You could also put cotton swabs, cotton balls, small towels, and even extra loofahs on large, covered jars and display them on the bath. Your bathroom will look ten times better! Again, this is a functional and stylish piece in one. The shower curtain takes the most space in the bath; don’t ruin the bathroom with really ratty or outdated-looking curtains. Play with colors instead! Do away with your boring ol’ shower curtain and go for modern ones with artsy or compelling prints or patterns. When choosing a shower cover, make sure it complements the color scheme of the bathroom so it doesn’t clash with everything else or worse, defeat the purpose of updating the space. Painting in the bathroom? You bet! A tastefully designed artwork sets the mood of a space and also makes place looked polished and professionally designed instantly! Because art is subjective, go with your gut. Just make sure it complements the space. If you have a bath tub, we recommend putting the painting near this area. Don’t put the painting near the shower if you don’t have a bath tub; install it near the sink instead so the artworks won’t get damaged by water.